'Y'all not going to die on my watch:' Kittens survive Hurricane Michael's fury, and are now adoptable originally appeared on goodmorningamerica.com. Four kittens who survived Hurricane Michael's devastation and a roof collapse are now up for adoption at a local shelter, after being spotted cuddling among debris live on-air by ABC News' Rob Marciano. 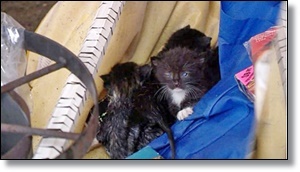 The kitties were found in a home with a collapsed ceiling in Panama City, Florida, and have become a symbol of resilience and hope for some in the wake of the ferocious storm. Marciano was assessing the damage to a home with a local resident who said that when the ceiling collapsed, "four kittens came down with it." "Four baby kittens," she added. "And my cousin took the kittens and said, 'Y'all not going to die on my watch.'"